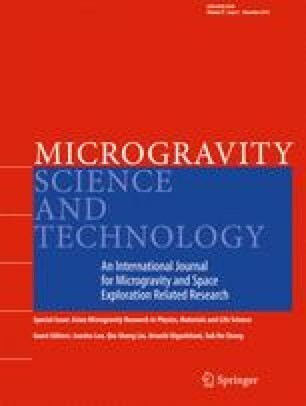 InxGa1−xSb bulk crystals are to be grown using a GaSb(seed)/InSb/GaSb(feed) sandwich-structured sample onboard the International Space Station (ISS). The InGaSb crystals will be grown on top of GaSb seed single crystals with different orientations viz., (111)A, (111)B, (110), (100) in order to examine and understand the growth kinetics of the crystals. In the present work, a numerical model of the crystal growth system has been developed to investigate the interface kinetics effects on the growth process by taking kinetics coefficient into account. The proposed numerical model was applied to evaluate the effect of crystal orientation on growth rate. Simulation results showed that the kinetics coefficient, whose value depends on crystal orientation, affected the growth rate of InGaSb crystal and the dissolution rate of GaSb feed crystal in the sandwich system. This work was financially supported by a Grant-in-Aid for Scientific Research (B) (No. 23360343) and (No. 25289087) from the Ministry of Education, Culture, Sports, Science and Technology of Japan.